In our previous blog on electric violins we looked at instruments that are designed from the ground up as electric instruments – however, for many people buying an expensive second instrument purely for live use isn’t a practical option. In Part 2 we’re going to have a look at pickups that you can attach to your existing instrument. Why do I need a pickup? Traditionally violins were amplified using a microphone. Bluegrass players would have a few microphones set up at the front of the stage and when you wanted to be louder you just stepped closer to the mic. Simple, right? The problem with this is that microphones only really work well in this context when reinforcing the sound, ie making an existing performance a little louder for the audience. In a modern capacity the volume is often many times higher than what you would hear acoustically, and that means you're likely to encounter the nemesis of every sound engineer: feedback!. What is feedback and why is it a bad thing? Feedback is when a microphone (or equipment with microphonic qualities such as guitar pickups) picks up the sound of itself coming through the amp, creating a loop where the microphone picks up the amplified signal and further amplifies it. This creates an unpleasant squeal or howl. Feedback can be damaging both to your ears and to musical equipment, so it's something you want to avoid. The louder the context you're playing in, the more likely it is you'll encounter feedback ,so this is something that should be factored into choosing a pickup. The advantage of pickups over microphones is that they're reading the surface they're attached to rather than the air around it,so they are less likely to pick up the amplified surface. That doesn't make them immune to feedback: if you hold your violin up in front of a powerful speaker you'll feel the body vibrate as the sound waves from the speaker bounce against it. This vibration will be picked up by the pickup – so, if the loud noise coming from the speaker is your violin the a feedback loop is created. However, it greatly improves your chances of avoiding feedback when amplifying your violin. How does a violin pickup work and are there different types? Most electric violin pickups are technically known as transducers, which means they take the vibration of a surface and convert it into a signal that the amplifier can read. This is similar to how a microphone works except it reads vibration in a solid material contacting the pickup as opp osed to a microphone that reads vibration from the air around the microphone. A transducer needs to be fixed to a part of the instrument that vibrates significantly as the instrument is played, so the best places to attach it are the bridge or the soundboard. Some pickups attach directly to the bridge, others to the body and others between the two. The Fishman V200 is a good example of a pickup that mounts into the bridge itself. It slots into the little gap underneath the wing of the bridge, so can be removed if necessary although regular moving of a pickup will lower its life expectancy dramatically so we recommend it stays put as much as possible. The advantage of the transducer being attached to the bridge is that it gets a very strong signal from as close to the strings as possible. There’s a downside to this in that because it’s reading vibration mainly from the strings, you won’t hear any of your violin’s natural character coming through, but from a functional point of view it’s a good way to amplify the violin. The Headway Band is a good example of a pickup that mounts onto the body of the violin. It fits very quickly and easily in that the pickup is encased in a plastic tube that wraps around the violin and fastens with Velcro – this gives you a few big advantages over other systems in that it’s easy to remove if you use your violin in classical circles where a pickup isn’t the done thing or if you want to swap between instruments, and it doesn’t require any modification to the instrument so there’s no need to make adjustments to an expensive hand carved bridge. It also usually sounds very good as it’s reading the part of the violin that makes the sound you hear acoustically, so you get the flavour of your own instrument coming through more than you do other transducer systems. The downside that since the pickup is reading anything that happens to the body, you'll hear more handling noise as you move about with the instrument, and it's more feedback prone. We'll talk about feedback in a few minutes. 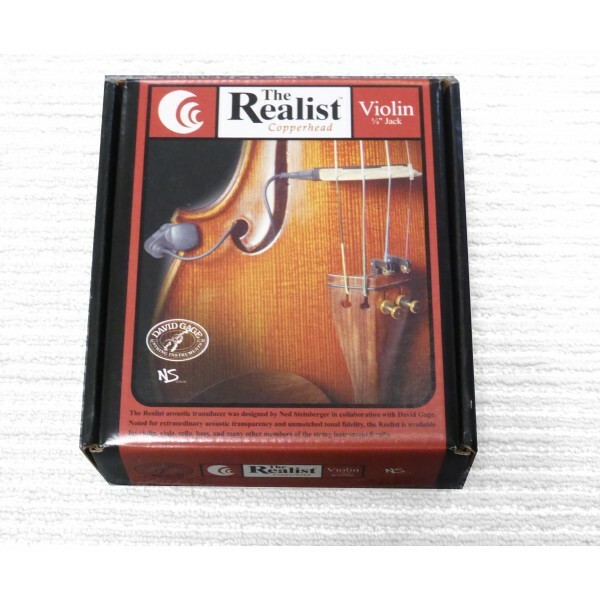 The Realist is a good example of a pickup that fits between the bridge and violin. This type of pickup connects to both the bridge and the violin so it produces both a strong signal and a good flavour of the violin itself. The main perceived drawback is that by adding a layer of material between the two it arguably reduces the efficiency with with vibration is transferred from string to violin, so compromising the acoustic sound of the violin. However, in terms of audible difference this is likely to be very subtle indeed so, whilst it's worth bearing in mind, it's probably not that big a deal for the majority of players. It also raises the height of the bridge, so some players ask for the bridge to be lowered when fitting such a pickup. Alternative brands may be thicker than the Realist, so increasing the height more and affecting the sound more, so bear this in mind when choosing a pickup. So is a microphone out of the question then? Microphones can work very well in situations where the instrument is close to being loud enough on its own and just needs a little help. They can also work well in situations where you have a lot of control – such as your own PA system and an engineer who knows how to set up for your situation – and can produce a very good sound quality. As well as having a microphone set up on a stand there are a few specialist mics that can be clipped to the violin, and will typically sound very good. They're not a good idea in environments such as rock concerts where you need a lot of volume to compete with other instruments, where you do not have control over your environment such as setting up to play at a wedding reception, or where you need to move around on stage. How do they plug in? Most pickups use either a 1/4” or or mini jack output that can be plugged into any instrument level amplifier source. 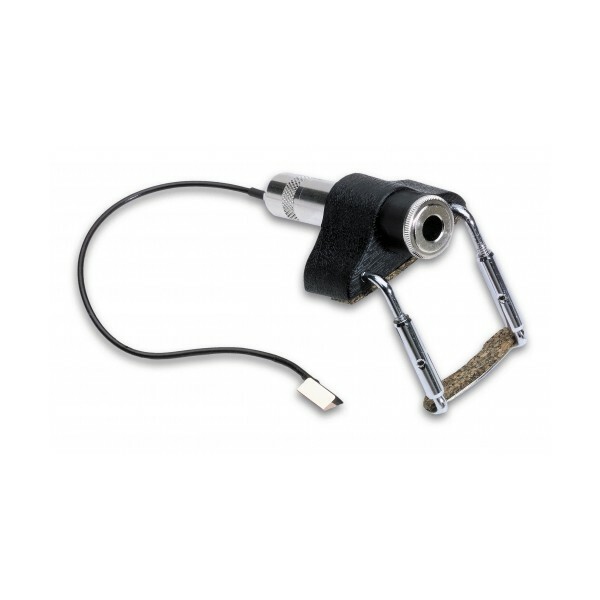 We prefer 1/4” as it's the standard for unbalanced audio equipment such as electric guitars, so there's far less chance of arriving at a gig without your lead and not being able to borrow one! 1/4” is also more robust. We also prefer systems that anchor solidly to the instrument so that you don't risk damaging the instrument when your plugging and unplugging: the Fishman V200 and Realist are both very good in that respect. Do pickups need to be professionally fitted? It depends. 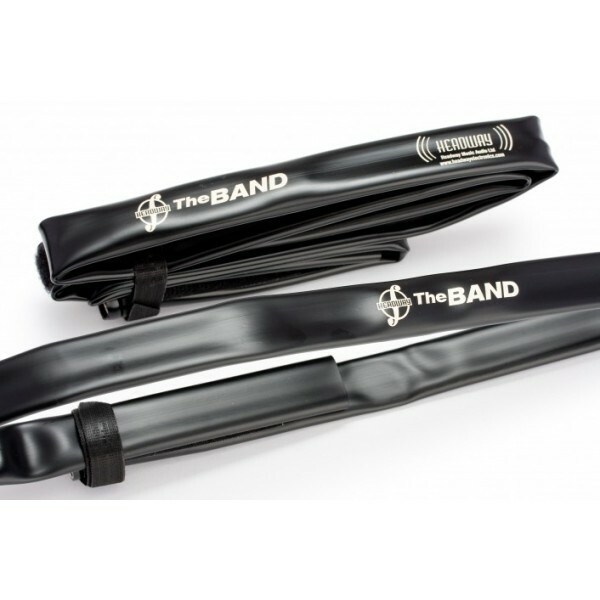 The Headway Band is simple enough for even the most technophobic musician to fit – pickups such as the Fishman V200 and Realist are not hugely challenging but if you're not sure it's better to ask the shop you buy from to fit it. Some pickups are built into the bridge itself and require the bridge to be professionally fitted as per a traditional bridge. We do not personally recommend these pickups as, lthough some of them sound great, it means the pickup is prone to all the problems that can befall a bridge, and a warped or broken bridge is going to be an expensive replacement if you have to replace the pickup too. We can fit any of the pickups we sell free of charge, while you wait (subject to staff availability). Why buy a pickup over a electric violin? There are pros and cons to either approach. The obvious pro is that a quality electric violin is a fairly big purchase, and if you're an experienced player you will need an instrument of reasonable quality. A £200 pickup fitted to a reasonable acoustic violin will give you a far, far better sound than a £200 electric violin, so for professional results on a budget the pickup is the better option. You might also feel your existing instrument is personal to you and you want to play the instrument that is familiar rather than have to get to know a new one. On the other hand, and electric violin is always a head turner when performing and many feel an electric instrument is an important statement of intent. It is after all a show you're putting on! Electric instruments are also a little less feedback prone. At the end of the day though it comes down to personal choice and what you're comfortable with: both are good solutions to live performance and you ultimately go with what feels most comfortable to you. For more advice about violin pickups and your specific requirements please feel free to phone the shop on 0161 834 3281 ext 606 and we'll be happy to help. In Part 3 we'll be looking at how to amplify violins.